Great wings are hard to come by. Good wings are fairly easy to find and bad wings are more common than we’d like to admit. Fortunately, The Wing Counter is like the unicorn of chicken wings. Crispy? Check. Fantastic sauces? Check. Amazing dry rub? Check. Gluten free? Check (except for soy sauce based sauces). 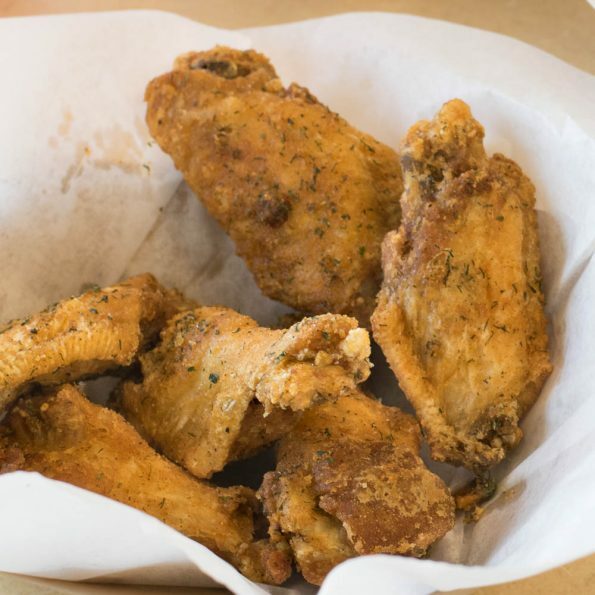 You read that right, The Wing Counter has crispy wings that are gluten free! We had a chance to head over to Glendale to talk with owner Shane Sender, here’s what we learned. 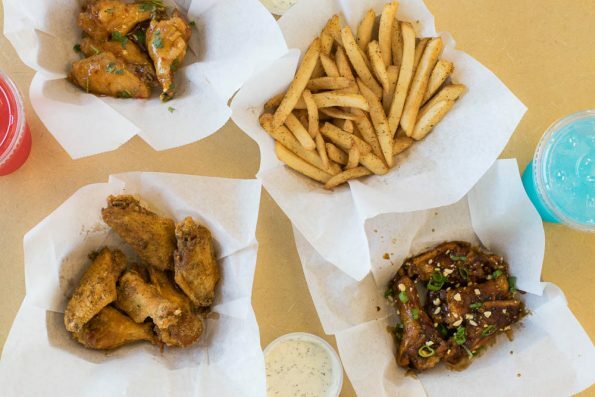 The Wing Counter prides themselves on their crispy wings. The trick? Rice flour. The rice flour helps them to have a lighter coating which crisps up better. This happens to make the wings gluten free. All of the wing flavors except Kung Pao and Teriyaki are gluten free. The fryers used are even separated into gluten free, french fries/boneless wings (not gluten free), and beignets. TWC Dry Rub- This one was hands down our favorite. The use of dill was super interesting and added a whole new level of flavor! This is also the seasoning used on the seasoned fries (also just as tasty there). Buffalo Hot- This is a traditional buffalo wing sauce at its finest. If you are a buffalo sauce fan, this vinegary and spicy sauce is perfect. Be warned, it packs a punch! Sriracha Honey- This sauce is well balanced between sweet and spicy. What is really wonderful about this sauce is that it isn’t just sweet. It actually has honey notes to it. Thai Sweet Chili- This sauce is exactly what you’d expect from its name. Similar to the Sriracha Honey in that it is sweet and spicy, this differs in that there is no honey note and the spice is more of a Thai chile. Kung Pao- The Kung Pao sauce definitely delivered a pow! Salty and spicy, this was probably our second favorite wing sauce. It delivered a unique Asian flavor not common to wings. Topped with cilantro and peanuts, every bite was bliss! 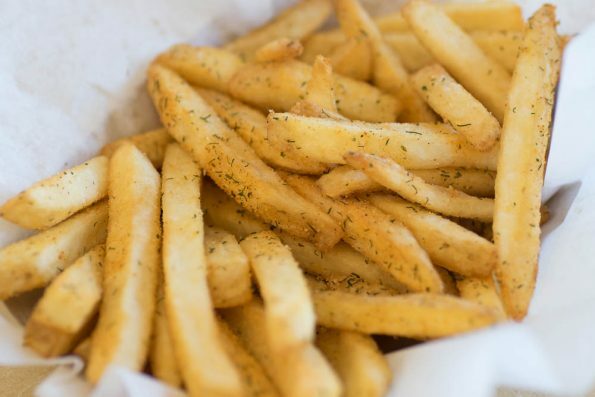 Seasoned Fries- We love crispy well seasoned fries. These certainly met our expectations and blew them out of the water. Using the same TWC Dry Rub as the wings, these fries are a must try! Homemade Ranch Dressing- Made in house, this ranch dressing is the ranch dressing all others hope to be. Using dill, which is featured prominently in the flavor profiles of TWC, this dressing is perfect with wings and fries! Southern Style Beignets- We have yet to go to Louisiana, but we’d be hard pressed to say it gets much better than these. Topped with powdered sugar and/or caramel, you’ll want to save room for the beauties (we know, it will be tough). The Wing Counter is truly sensational. From the amazing and knowledgeable staff (General Manager Martez Ronan really knows his stuff, including most of the customers on a first name basis) to the delicious food, it really can’t be beat. If you live in Glendale and haven’t been, you have no excuse for not visiting. If you live in Scottsdale or the East Valley, we assure you that it is worth the drive. What are some of your favorite wing joints? Do you prefer drums or paddles (we didn’t know this was the name for them until our visit)? Let us know! Leave a comment below or use the hash tag #GeekEats.